Your help is vital towards our work with the Orphans and Poor of the World. Thank you so much. Your support helps one orphaned child to live in a private orphanage with food, clothing and medical care. This gift will provide a warm and safe environment to live in. Feeding a family when you have no money is tough. Your gift of a food parcel, with enough to eat for an entire month, means that we can respond quickly to a struggling family’s needs and help them cope in difficult situations. A food parcel consists of: flour, sugar, butter, salt, oil, tinned vegetables and tinned cold meat, biscuits, washing powder and pasta. Education is one of the most powerful weapons against poverty and brings hope for a future to every child on our education programme. Education changes lives and it does not cost much. The need is great: we have over 2000 children on the waiting list. Our programme covers school fees, school materials and medical assistance (for one child for a whole year). Winter is harsh in Romania with temperatures dropping way below zero. This is when poor families struggle the most with basic things like trying to keep their home warm. Many are in desperate need of firewood. Your support will help keep families from freezing this winter. Many poor villagers live miles away from the nearest water well. This means that with no transport they have to walk long distances with heavy water loads back to their homes. In the freezing winters, where temperatures go down to -25 to -30 degrees, this can become a treacherous task. Your contribution will assist us in starting to dig for our next well providing a builder and materials to complete the new construction. One well will give many villagers access to clean water. A cow will help transform the lives of families living in severe poverty. Cows provide manure, milk and where necessary transportation. Buying Pregnant Cows also means the family receives an additional asset. 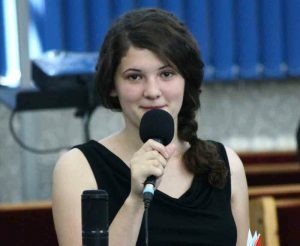 Madalina has been at the Hand of Help Orphanage since she was 5 years old, after her father died in an accident. Due to the large size of her family, her mother was unable to feed all 13 children so her and her siblings were taken to the orphanage. Since leaving the orphanage at 18 she has enrolled at Iasi University for a three year course, studying Ortho-dentistry. Her costs at Uni are: Books, food, expenses for course materials, travel, living expenses and toiletries. Oi is wanting to ask its supporters for £85 pcm to support her through Uni. Click the link below to donate 1 months support for Madalina.